Common transfection reagents require considerable efforts to optimize the DNA:lipid ratio and the amount of DNA used and, as a rule, involve considerable expenditure of time – 4 days – from seeding the cells to reporter gene assay. 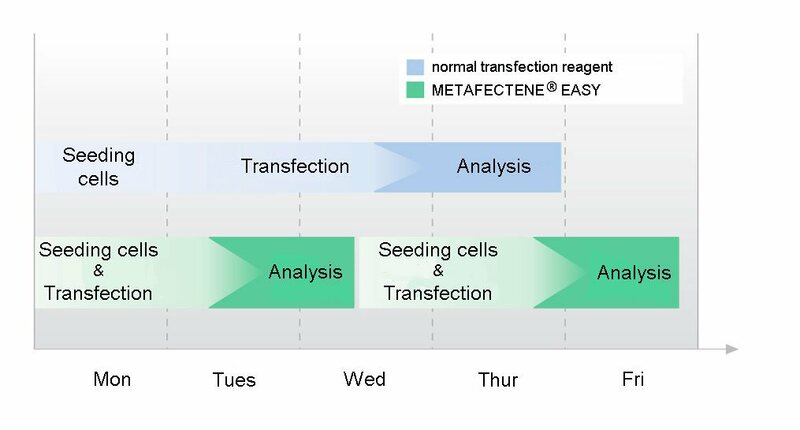 The idea behind the development of METAFECTENE® EASY⁺ was to establish an efficient transfection reagent combined with a fast and easy protocol. METAFECTENE® EASY⁺ works with two predefined DNA/lipid ratios and a predefined amount of lipoplexes combined with a "Fast Forward" protocol. This enables high transfection efficiencies to be reached for a variety of robust mammalian cell lines and primary cells while minimizing optimization effort. Using the "Fast Forward" protocol, cells are seeded and subsequently transfected without being allowed to grow on the vessel surface by incubation overnight. This results in a time saving of 24 hours, allowing two successive result-dependent transfections to be performed within a single working week.